Feature photo by tarotastic. Photo above by Ryan Libre. The Kachin people of northern Myanmar are sustained by their Christian faith. I check my clock. 12:10 am on December 1st. Here in Kachin, the Christmas season has begun. Unlike ethnic Burmese, who form the majority in Myanmar, the six tribes collectively known as Kachins are devout Christians. Their faith has bound the Kachins together as one people and helped them endure decades of repression, suffering and loss. For me, a nominal Christian, living among the Kachins opened my eyes to the enduring power of religious faith. Hardship is a fertile ground for faith. The world’s major religions were founded by prophets who sought out suffering in their quest for God. For Christ and Buddha alike, self-denial was the key to spiritual grace. Religion provides comfort in hard times. Faith enables the devout to connect their personal tragedies to a broader sense of shared sacrifice. Religion is a prism through which tragedy acquires meaning. I’ve heard cynics claim that religion is the cause of suffering in the world, but it seems more accurate to say that suffering is the cause of religion. 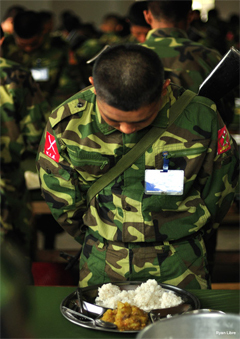 At daybreak, cadets at the Kachin military academy stand at attention and recite the five oaths of the Kachin Independence Army. Twice, they honor the martyrs who gave their lives for the nation and people. When the oaths are finished, they file into the canteen and say grace, giving thanks for the morning rice. Martyrdom is the pinnacle of grace for many believers. 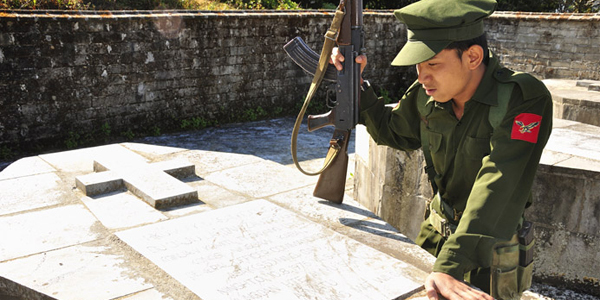 While the Kachin never engage in suicide attacks, their faith helped them withstand the loss of thousands of young men in battles with the Burmese military. Late one night, I spoke with a young pastor from northern Shan state whose hometown was recently destroyed in fighting. He had traveled far to meet me and spoke with care. The Kachins celebrate Sweet December on the last night of November. Before the midnight carolers jolted me from bed, I sang Christmas songs at the Kachin Independence Organization headquarters. The hall where we sang was decorated red and green, the colors of both Christmas and the Kachin national flag. We stood in the pews and sang the same songs over and over. When the carolers were gone, I thought about the white church on the Common in Craftsbury, Vermont. My family goes there once a year, on Christmas Eve, but it’s been five years since I was home for Christmas. My land, my future homestead, is just a two minute walk from the white church on the Common. I had never planned to attend services. There’s hopelessness in Kachin, fed by grinding poverty, brutal repression, a heroin epidemic and the constant threat of war. 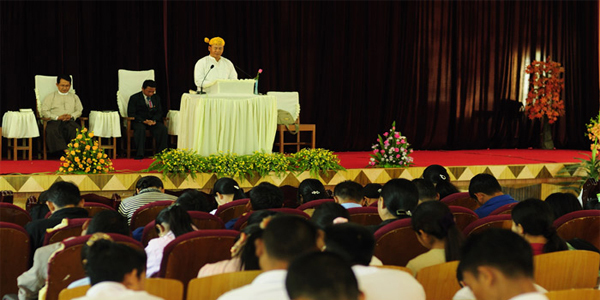 The Kachin Church is part of the social fabric that holds the nation together, that gives the people dignity and hope. >The Kachins don’t have much, but their faith provides an excuse to dress up, to sing, and to meet the neighbors. When suffering comes, as it inevitably will, their faith provides much more. Growing up, most of my friends were dismissive of religion, and of Christianity in particular. It’s easy to ridicule the religious right in America, and for coddled children of the â€˜80s, flooded with Christmas presents, there was never much need for faith. In my crowd, observant Christians were Jesus Freaks, a slightly suspect minority. I thought about the Christians I had met in Kachin, their sincerity and goodwill, and I was ashamed of my dismissive attitude. I realized that although my friends and I never needed faith growing up, we probably will someday. On one of my last mornings in Kachin a man asked if I was a Christian. “My family is Christian,” I said. I pictured the white church on the Common in Vermont and heard the choir singing at midnight on Christmas Eve, the sound of the bells in the cold December air. I pictured the gentle smiles of Kachins who had nothing but their faith in God. It wasn’t an awakening. There were no angels, no organ music, no slanting shafts of light. I simply decided to accept my Christian heritage for what it is – a community that will be there, waiting for me when I go back home.